When it comes to describing the hopes and ambitions of a couple on their wedding day, the word “forever” is one of the most apt and appropriate words you can find. This is the first day of the rest of their lives together and the hope that their love for each other will last to the end of their lives is something that underpins many weddings. This is why there is often a need to focus on the permanent nature of a marriage and the Forever My Love wedding invitation bu Ditsy Chic is an ideal way to capture the traditional essence of a wedding day. 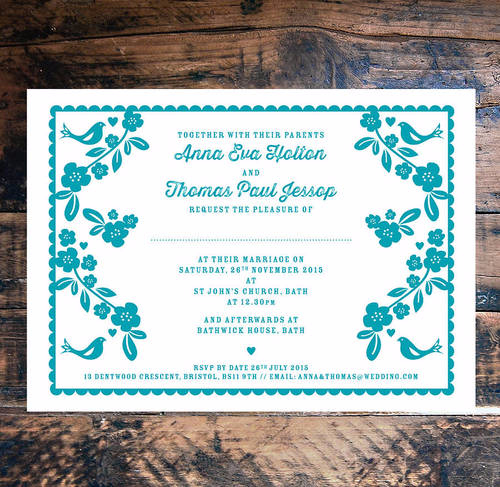 The invitation looks stunning with its lino cut style offering an invitation that is stylish and elegant. This is a design that will look great, making it the sort of thing that the wedding guests will be delighted to receive. Those close to the wedding party will find that it provides an ideal memento of the special occasion and is something that they can look back on fondly for many years to come. A strong point of the invitation, in addition to the classic style, is the fact that it is possible to customise the colour palette on offer. If the happy colour is opting for a colour scheme for their wedding or they are keen to create an event based around their loves and passions, being able to send out invitations with the perfect colour can be a big help. It is even possible to choose coloured envelopes, ensuring that every last detail is taken care of. With this invitation available in a card and postcard invitation, you will find that there is no better way to invite your friends and loved ones to the ceremony that begins the rest of your life. Tags: Lino Cut, Love Birds, Peacock Blue, Postcard.